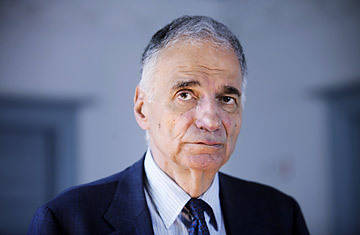 Ralph Nader has been many things: lawyer, consumer-rights bulldog, political activist and perennial third-party presidential candidate. He has now added a new title to his business card: fiction writer. His latest book, Only the Super-Rich Can Save Us!, is a 700-page populist fantasy in which a small group of billionaires and media moguls  led by Warren Buffett and including Ted Turner, George Soros, Bill Cosby, Yoko Ono and Phil Donahue  pool their massive resources to reform the U.S. With the help of a $15 billion war chest and a p.r. campaign starring a talking parrot, the group successfully unionizes Walmart, ends corporate influence on Congress, makes Warren Beatty the governor of California and legalizes industrial hemp. TIME talked to Nader about the origins of his book, its celebrity characters and the U.S.'s real-life political battles. You say in your author's note that this book is not a novel. And yet it's not nonfiction. So what is it? In the literary world, it's either called a work of speculation  "What if something happened?" "What if somebody did this?"  or a practical utopia. We haven't had many practical utopias. Russell Jacoby, a professor out in California, wrote a book called The End of Utopia in 1999, which argues that the idea of imagining better futures has diminished, as we wallow more and more in our desperate state of societal and governmental decay. So I tried to revive the genre, so to speak. Was that your goal in writing the book? To create a practical utopia? No. As you go through year after year, as many civic advocates do, being overwhelmed by the corporate lobbies and their allies in government, you say to yourself, 'If we only had more media, if we only had more money, if we only had more field organizers, if we only had better ideas and strategies.' That's what produced the book. What if we had a collection of superrich elderly, retired people who are very dismayed at the state of their beloved country, and what if they got together and really poured money in? What would happen? And what would happen is a major power collision with corporate goliaths and their government allies. You mention your group of the superrich. How did you come up with that idea, with those characters? First of all, the civil rights movement, contrary to popular impression, was funded in significant part by superrich people. The right-wing movement in this country is funded by people like Richard Scaife, who's put in a quarter of a billion dollars at least. I decided to pick [my characters] because they all brought something to the table: Barry Diller, media; Ted Turner, media; George Soros, the Open Society Institute and institution-building; Peter Lewis, insurance; Joe Jamail and Bill Gates Sr. on access to justice. They all brought something to it. How does Yoko Ono fit into the group? I wanted to have more women than I could find who were older and quite well-known. She brings moral sentiments and aesthetics. Aesthetics is a very understressed dimension of civic action: music, song, beauty, posters, logos, all these things. Have you met all the people you based these characters on? Did you say to any of them, "I'm writing this book about you"? Not until I finished it. Well, I got through to eight of them; they were bemused, but obviously they weren't going to say much until they saw the book. But some of them were very pleased. Did you ever consider making yourself a character in the book? That's what Warren Beatty wants. He wants to make this a movie, but only if I'm in it. The jumping-off point for the story is the government's response to Hurricane Katrina. Was that the genesis of the book idea for you as well? It was one of them, yeah. Another of them was how demoralized they were, these superrich older people that I talked to. I said to them, "How could you be demoralized? You're sitting on 5, 6, 8 billion dollars. For a billion dollars, with field organizers in every congressional district, you can get a single-payer health-care system.' What's a billion dollars to these people? The events in the book read like an unstoppable wave of progressivism. Isn't it kind of a fantasy to expect that to actually happen? Well, I tried to unleash almost everything short of detonations [on the main characters]. I mean, the other side really unleashed about everything they had, but you see, they weren't used to being taken on by the big guys or in ways they'd never seen before. They're used to meat-and-potatoes lobbying: put the ads on, get the think tanks going, throw more money in the PACs. Very traditional. And you think that would be their response in real life as well? Well, if they were caught by surprise, sure. What do you think about the current fight over health-care reform? Well, it's going down heavily. Obama's not going to get a public option. By the time the thousand-page monstrosity of complexity and ambiguity gets to his desk, it's going to be a shred of what the majority of doctors, nurses and the people in this country want  which is full Medicare for all. What's your take on President Obama thus far? Weak. Waffling, wavering, ambiguous and overwhelmingly concessionary. Is any of that enough to get you back into the political arena? It's too early to say. One thing is, I always want the progressive agenda represented on the ballot, even in a rigged two-party tyranny. I wish other people would do it, but as far as me, it's too early to say. Do you think third parties have a shot in the next elections? Sure. They'll be called the Bloomberg Party. Some billionaire will come in like Perot and turn it into a three-way race. There's so many billionaires, and a few of them are quite enlightened. You don't need a right-wing billionaire because they've already got the Republican Party. Read TIME's 1969 cover story on Ralph Nader. See 25 people and companies that are using ethical consumerism to change the world.